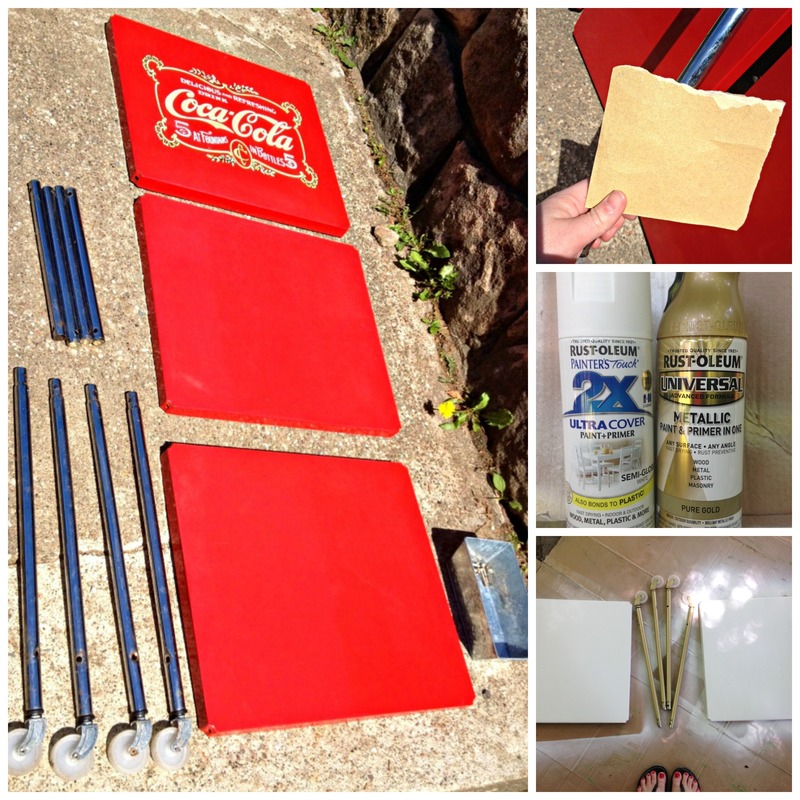 I’m so excited about this DIY I’m sharing with you today! If you’ve been following along you know I’m making over our dining room. It’s come a long way but still needs a few pieces and finishing touches. This past weekend I remembered I had an old utility cart in storage. 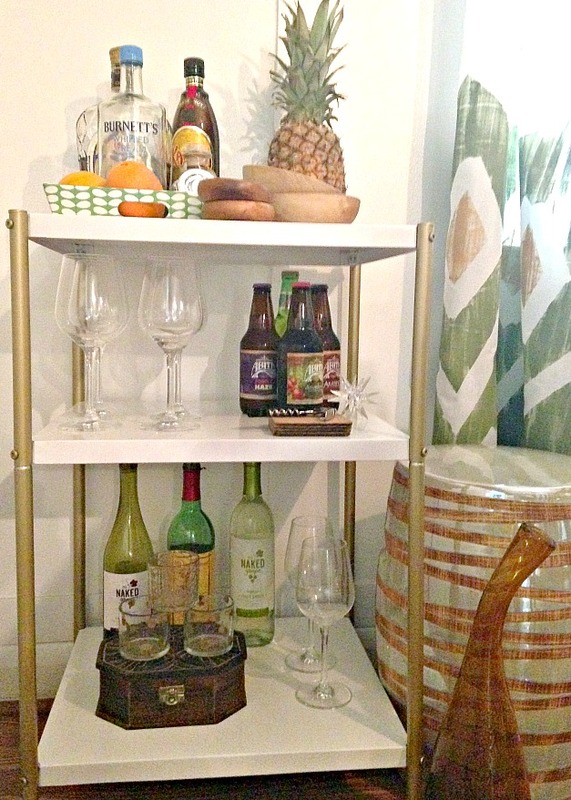 I pulled it out and decided to turn it into a bar cart. Everyone needs a pretty place to put their liquor, right? This bar cart started as an ugly Red Coca-Cola rolling cart. I was into that sort thing at one time. I was so excited to take it apart and get started that I forgot to take a picture before! Here it is all ready for sanding. IT was in decent shape already, just a few rusty spots on the legs. I gave it a light sanding and then just started slinging paint.I used Rustoleum Paint + Primer Semi-Gloss White spray paint and Rustoleum Pure Gold Spray Paint. I finished it off with a coat of spray poly for protection. Thanks Erica! I should have the curtains post up Wednesday 🙂 They aren’t really the look I was going for but I don’t hate them so they’ll stay for now. 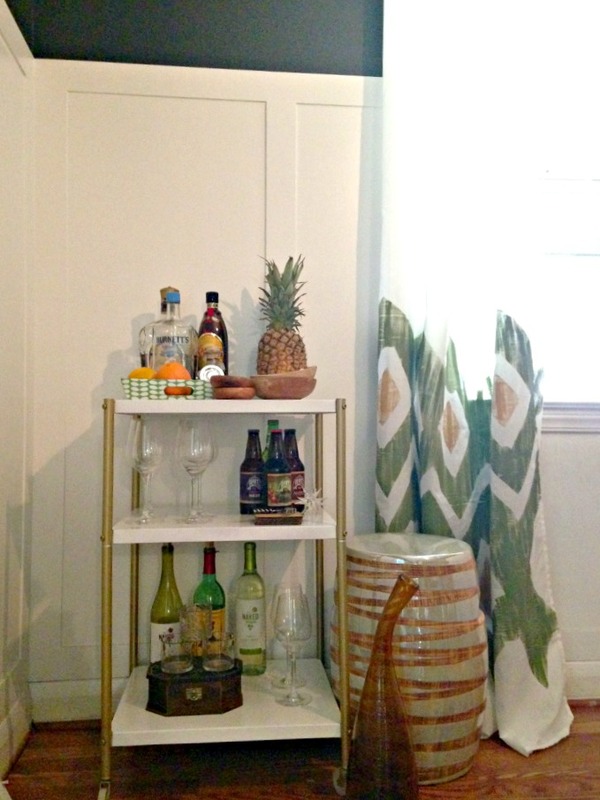 I love a good bar cart! What a great makeover!! LOVE LOVE LOVE this! Thanks for visiting us at Merry Monday’s Link Party! We’re thrilled to have you! I feel like I need it in my dining room. you would never know it’s the same thing! loving that gold color, and what are those curtains? are they a diy? Love what you did with the old cart…great makeover. Love all the changes you’ve made in your dining room. Thanks for sharing on Merry Monday. Thanks, I love Merry Monday! Love your makeover – I’m loving all things gold right now myself! Thanks for sharing at Monday Funday! Pinned it! It’s amazing what you can do with a little paint isn’t it? This project turned out great! Great bar cart. I wish I had a place for one and that we actually drank. We do not, but I love the way bar carts look. Not sure bottled water would look good on display.